Will your life get boring after Halloween ends? Will your nights descend into stress as you prepare for the holiday season? Not if Skate World has anything to say about it! We’re doing our part to help your family make 2016 the best holiday season yet. How are we doing that? Through the power of roller-skating, of course! 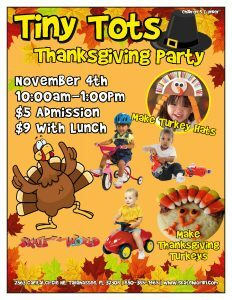 Tiny Tots Thanksgiving Party: Teach your littlest skaters about the spirit of gratefulness with our Tiny Tots Thanksgiving Party. We’ll be getting into the spirit of the holiday with turkey hats craft time, holiday cookie decorations, and all the fun of a normal little skaters session. 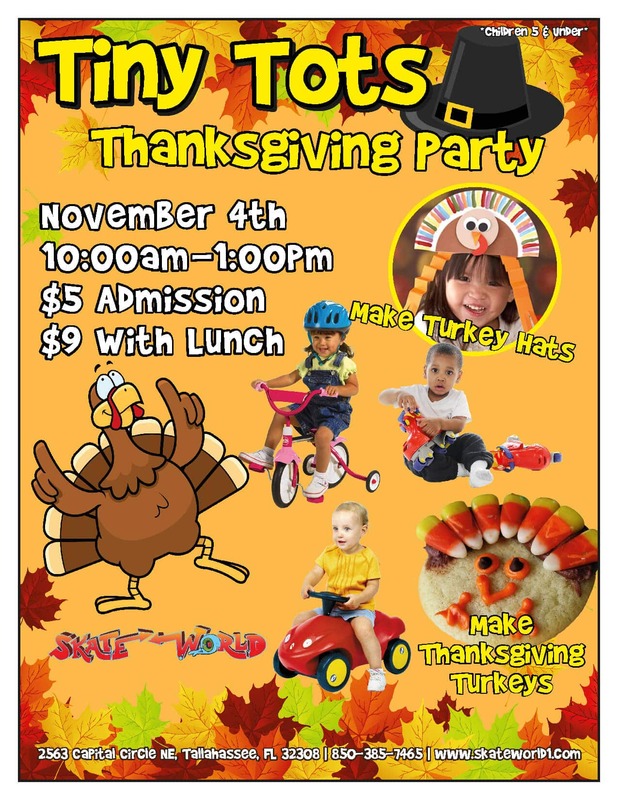 The Tiny Tots Thanksgiving Party is Friday, November 4th from 10am-1pm. We’ll have lunch, snacks, and plenty of holiday fun! Tiny Tots (Round 2): We have 2 Tiny Tots skates every month, so it stands to reason that we’d have double the holiday fun! Your toddlers and preschoolers will have a blast making a handprint calendar during craft time on November 18th. We can never repay what U.S. Veterans have sacrificed for our freedom, but we can show our gratitude. Help Skate World support veterans in Tallahassee with a donation for Veteran’s Village. Bring blankets, sheets, towels, nonperishable food, and everyday household items for our local vets. You donate, we give you free admission! Veteran’s Day Skate is Friday, November 11th from 11am-7pm. Admission is $8 without a donation. When school is out, skating is in. We’re open December 14th-16th from 1-4pm. Time to get excited! If you’re looking for holiday family fun in Tallahassee, this is only the beginning. Call Skate World Center for more information on upcoming events, booking holiday parties, and fun skating gifts for friends and family.